Listen to your news websites, online magazines, RSS feeds and blogs - all read aloud for you with great voice & in real-time. 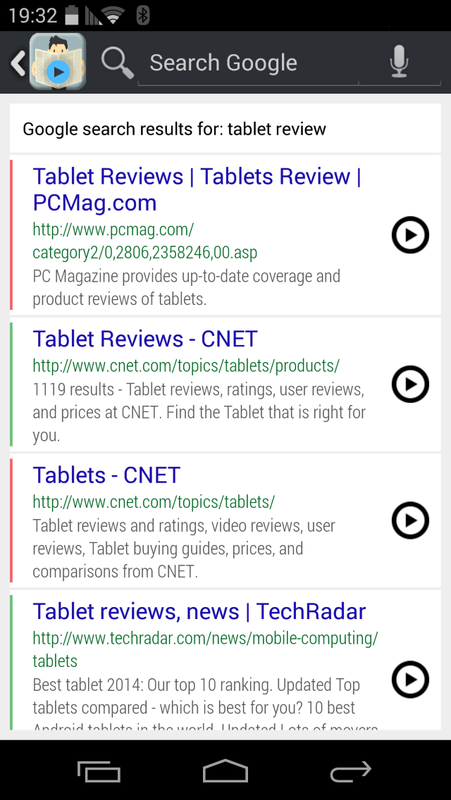 With Play News you can listen to news articles & updates from your favorite websites, create a personalized article playlist and even have Google search results read aloud. Have your pick from our ever growing catalog of news sites and magazines - or request your favorite websites to be added today. Create your own article playlist with Play News Inbox. Build an article playlist from your desktop or any other App and listen to it later. Search Google and have relevant search results read aloud to you. What makes Play News a unique solution? Play News makes it 1-click simple to listen to any webpage. As soon as an article is published online you can listen to it with Play News. Have your pick from our ever growing catalog of news sites and magazines, or request your favorite websites to be added today. Build your custom article playlist by sharing articles from different online sources to Play News. Integrated with professional graded "Text To Speech" for clear & natural reading voice experience. Fully synced subtitles with different font size for enhanced listening experience. 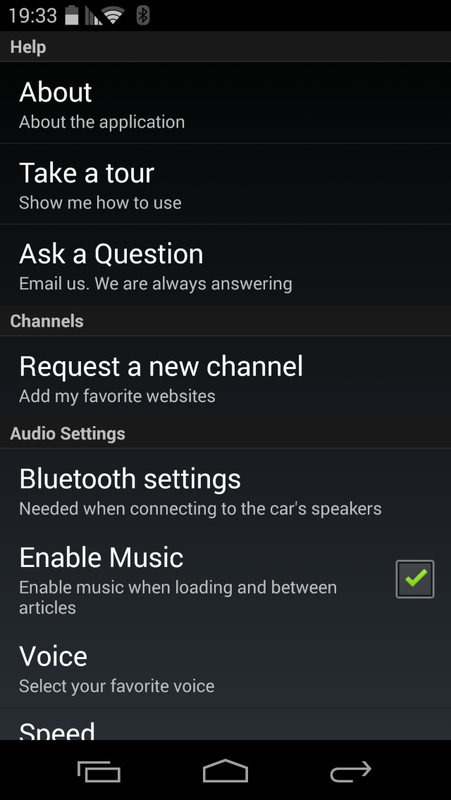 Fully connected to your car's Bluetooth system, supporting both mono and stereo mode. With just one click on the 'play' button, any website is turned into an audio channel. These words motivate us even more. Play News is the best! 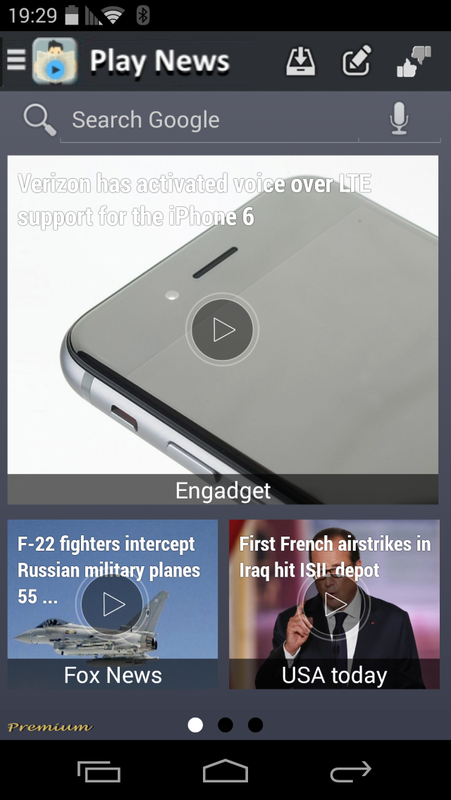 If you like your news read to you, this App is the one to get. No question about it. Get it! A good travel companion. 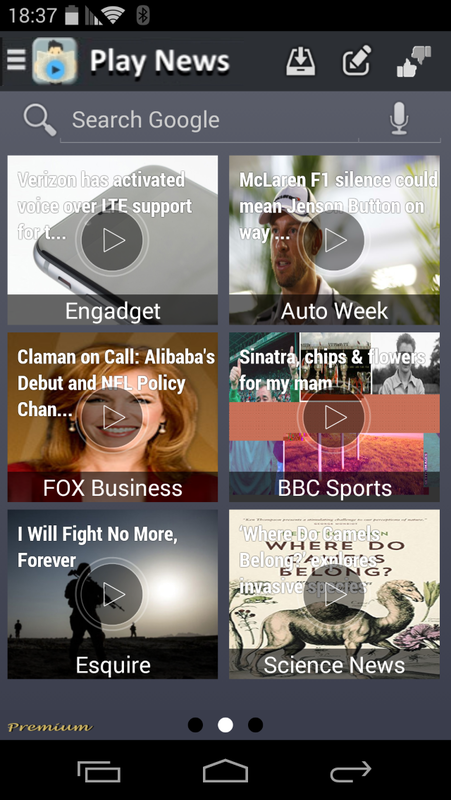 If you're a news junkie like me, you'll love this alternative to Audio Books. Life changing. Should be compulsory for sight impaired! If only I had discovered this earlier. Great in the car... I spend lots of time driving. With Play News I can pick the items I want read out loud instead of listening to radio news with no choice. Started reading an article and would like to continue listening it on the go? or planning to catch up with your favorite topics? 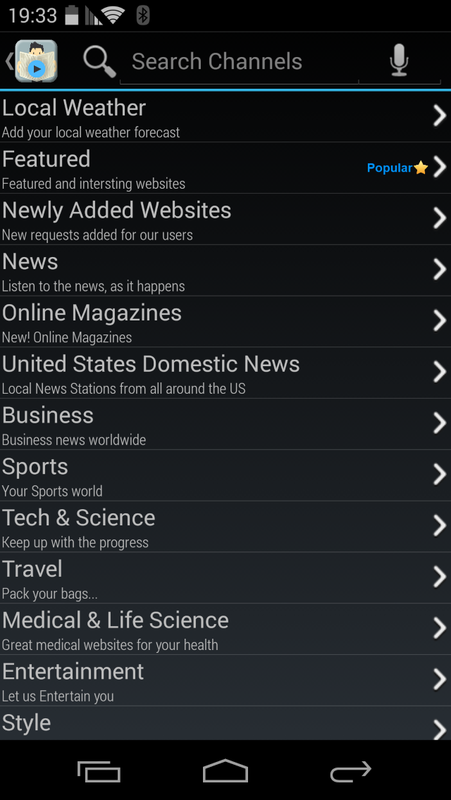 Play News Inbox is your solution. Sharing articles from other Apps. 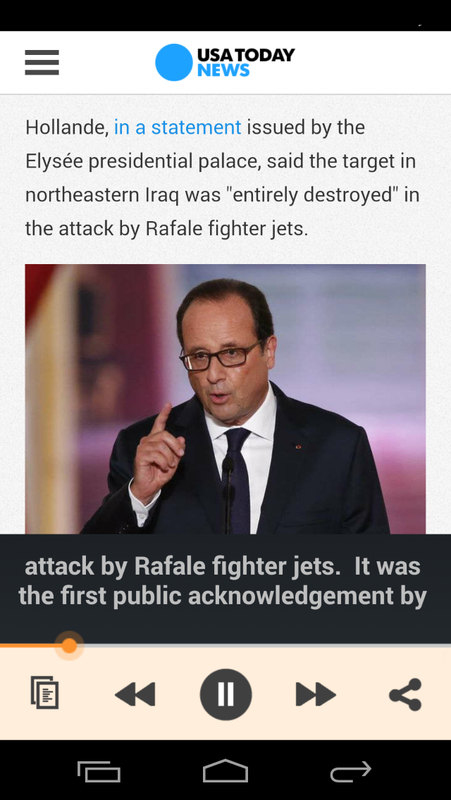 While viewing an article from any App, tap the 'Share' button. In most Apps you will find it in the options menu. This will open a list of possible sharing targets. Select "Add to Play News". At this point, you should see the article title and the 'Listen Later' button. Click on 'Listen Later'.... and that's it! You are done. The article awaits you in your Play News Inbox. Sharing articles directly from your desktop. Download the 'Play News Listen Later' extension from the Chrome store. 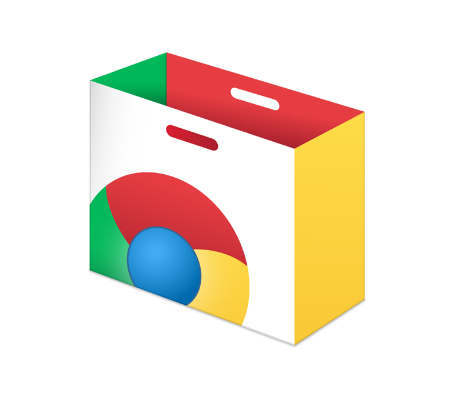 This will add a new Play News icon to your Chrome browser. Anytime you find an article that you would rather listen to, tap the icon and the article will be added to your Play News Inbox. 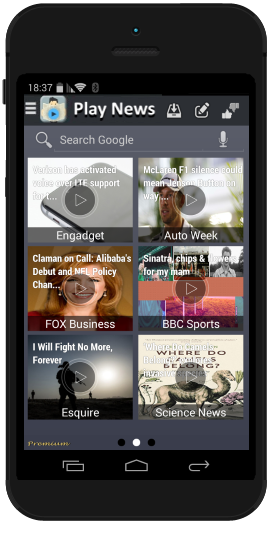 Get Play News Now. It's free.